Canopus (/kəˈnoʊpəs/; α Car, α Carinae, Alpha Carinae) is the brichtest starn in the soothren constellation o Carina, an the seicont brichtest starn in the nicht-time sky, efter Sirius. Canopus's visual magnitude is −0.72, an it haes an absolute magnitude o −5.53. 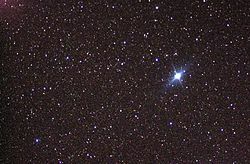 Canopus is a supergiant o spectral type F. Canopus is essentially white when seen wi the naked ee (altho F-type starns are sometimes leetit as "yellaeish-white"). It is locatit in the far soothren sky, at a declination o −52° 42' (2000) an a richt ascension o 06h24.0m. ↑ 1.0 1.1 1.2 1.3 1.4 1.5 "Database entry for Canopus". SIMBAD, Centre de Données astronomiques de Strasbourg. Retrieved 8 July 2012. ↑ Gray, R. O.; Garrison, R. F. (1989). "The early F-type stars - Refined classification, confrontation with Stromgren photometry, and the effects of rotation". Astrophysical Journal Supplement Series (ISSN 0067-0049). 69: 301. Bibcode:1989ApJS...69..301G. doi:10.1086/191315. ↑ Domiciano De Souza, A.; Bendjoya, P.; Vakili, F.; Millour, F.; Petrov, R. G. (2008). "Diameter and photospheric structures of Canopus from AMBER/VLTI interferometry". Astronomy and Astrophysics. 489 (2): L5–L8. Bibcode:2008A&A...489L...5D. doi:10.1051/0004-6361:200810450. ↑ Desikachary K, Hearnshaw JB (1982). "The spectrum of Canopus. II - Analysis and composition". Royal Astronomical Society, Monthly Notices (PDF)|format= requires |url= (help). 201: 707–21. Bibcode:1982MNRAS.201..707D. This page wis last eeditit on 19 Apryle 2017, at 02:22.